At 2pm local time today (3 Eastern, 2100 in Rome), B16 arrives in Santiago de Cuba for a three-day stay on the island -- one which, according to reports, has garnered considerably less buzz than Blessed John Paul II's celebrated pilgrimage in 1998. Indeed, it's worth repeating that never before has a pontiff so old traveled this far -- while Benedict XVI turns 85 in three weeks, JPII was three years younger and far less mobile at his final journey outside Europe. Still, even as the country's religious landscape has opened considerably since the last PopeTrip, Papa Ratzinger's first visit to a Communist country presents a unique set of hurdles, risks and potential rewards on both sides of the church-state coin. Highlighting the tensions at hand, the customary Sunday march to Mass by the Damas de Blanco -- the "Ladies in White," representing the wives, mothers, daughters and sisters of imprisoned dissidents -- took place under the glare of massive media coverage (above). While some 70 members of the group were detained last weekend, a leader of the Damas said yesterday that another 25 of their number were held in Havana and Santiago on the eve of the pontiff's arrival. The group has requested a "brief meeting" with the Pope on the state of human rights on the island. At the same time, a fresh challenge was thrown into the tightly-planned itinerary with yesterday's sudden arrival in the capital of the Venezuelan President, Hugo Chávez. Said to be undergoing radiation treatment in Cuba, the quasi-Marxist leader reportedly made no reference to the papal visit, yet when asked whether the Pope would meet with Chávez, the director of the Holy See Press Office, Jesuit Fr Federico Lombardi, left open the possibility, saying that "anything can change." Benedict and Chávez first met in a Vatican audience in November 2006. Notably, a top papal aide is intimately familiar with the island and its affairs. 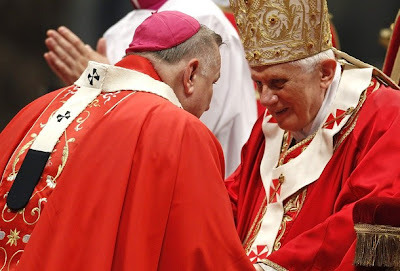 The recently-named Sostituto of the Secretariat of State -- in other words, the Roman Curia's "Chief of Staff" -- Archbishop Angelo Becciu served as Nuncio to Havana from 2009 until last May, when he received his first Vatican assignment in the senior slot. To put it mildly, the scene is complicated all around. And to explain it, the Stateside church arguably has no keener exegete than the bench's de facto policy chief on Cuban Affairs: Archbishop Thomas Wenski of Miami -- a South Florida native, longtime laborer among the exile community and protege of its "godfather" who, as one friend put it, fluently "speaks, thinks, curses and prays in (strongly Cuban-accented) Spanish." On Monday, March 26, Pope Benedict XVI will land on Cuban soil. The Cuban people, including Cubans from these shores, will receive him with the love and enthusiasm worthy of the one who "comes in the name of the Lord." He comes in his role as universal pastor of the Catholic Church — and since one of the most important responsibilities of the Pope is to confirm Catholics in the faith, the purpose of his visit to Cuba is pastoral: that is, to reaffirm the faith of Catholics on the island and, in turn, to highlight the importance of spiritual values to all Cubans. So, if the Pope is going to Cuba, it is also because he recognizes the valuable work of the Cuban Church — of its bishops, priests, religious and laity — who out of their poverty want to serve their people as a leaven of evangelical hope. 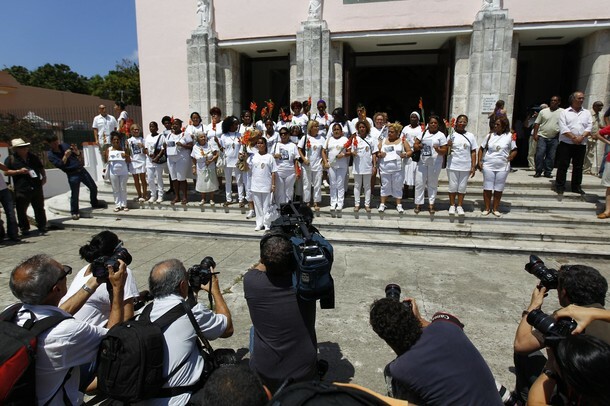 As Oscar Espinosa Chepe, an independent journalist in Cuba, commented in the Miami Herald, March 22, "The Catholic Church has given ample evidence of having been at the side of Cuba’s citizens, without discrimination of any kind. The pressure — offspring of the desperation caused by so many years of suffering and repression — to have it take positions that are biased and divorced from reality, far from helping in the current national context, undermine the work of building consensus for change and the decisive role of the Church as a bridge of communication among all Cubans, including, of course, our compatriots living abroad, who are an inalienable part of our country." We must recognize how difficult it is to assess from outside the thin line that exists between a cowardly retreat from a prophetic stance and prudence in the face of oppression in order to take advantage of the little space there is. Those who live in a different social context need to avoid committing grave injustices by applying simplistic criteria in their facile condemnations. We go to Cuba because the Cuban Catholic Church is inviting us. And the presence among the pilgrims of a large group of Americans alongside Cuban Americans will highlight the close historic ties that bind Florida to Cuba. Let us remember that this territory, during the years of the Spanish colonization, was part of the then Diocese of Santiago de Cuba. The visit of John Paul II marked a “before” and “after” among the Cuban people at the level of Church, although, at the time, no major changes were perceived in church-state relations. As a young Cuban priest said recently, "For everyone, those were days of joy on the streets, of energy, of a sense of freedom, it was spectacular; it was another people." Such were the effects of the visit of John Paul and we hope something similar will take place during this visit of Benedict XVI.